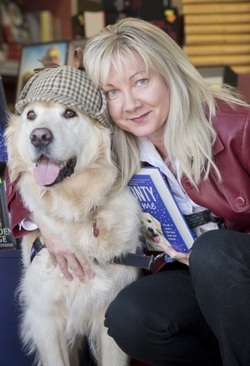 British-born mystery author, Louisa Bennet, studied Literature at the University of London and went on to learn Canine Linguistics from her golden retriever, Monty, which is how she discovered what dogs really get up to when we’re not around. Truth be told, Monty came up with the story of Monty & Me, and Louisa just transcribed it. She’s faster on the keyboard and less easily distracted by food and passing squirrels. Louisa also writes thrillers as L.A. Larkin.